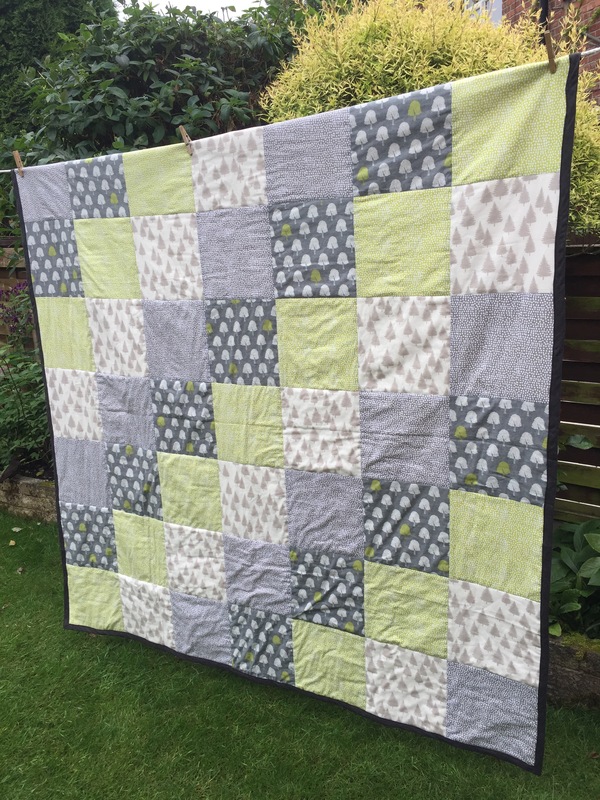 It isn’t my first attempt at making a quilt, that happened when Eldest was about 6 months old. Coping with being a new parent, selling a house and moving to a new area, I fancied an additional challenge. 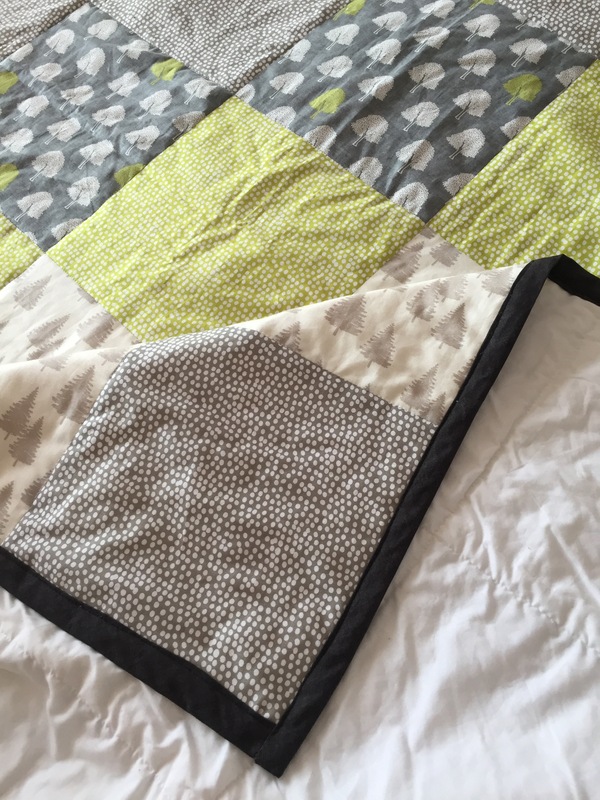 I decided to make a quilt for his pram and as my sewing machine was well and truly buried under boxes of junk, I sewed it completely by hand. Using paper hexagons and some fabric I had bought on the local market I set to work, much to the bemusement of those around me. It was rather a long winded affair but I managed to complete it while he was still young enough to need it in his pram! It lasted well, despite my hand stitching, and was used by both of his brothers. I started and failed to finish a much larger quilt for a double bed after that, it still languishes in a box somewhere in the back of beyond I’m ashamed to say… My next attempt was completed using scraps of material I had in my stash; from new pieces of cotton and a few fat quarters bought many moons ago to salvageable parts of Mr Postcard’s old work shirts and even a pair of my Dad’s old pyjama bottoms! I made this one especially for Mr Postcard to bring in his suitcase to Gibraltar when he moved here on his own a few months before we came to join him. It was a thin summery quilt and meant that he didn’t have to rush out and buy a whole load of new bedding in the interim before we arrived with the furniture van several months later. Next was this starry affair for the astronomy fan in the family. 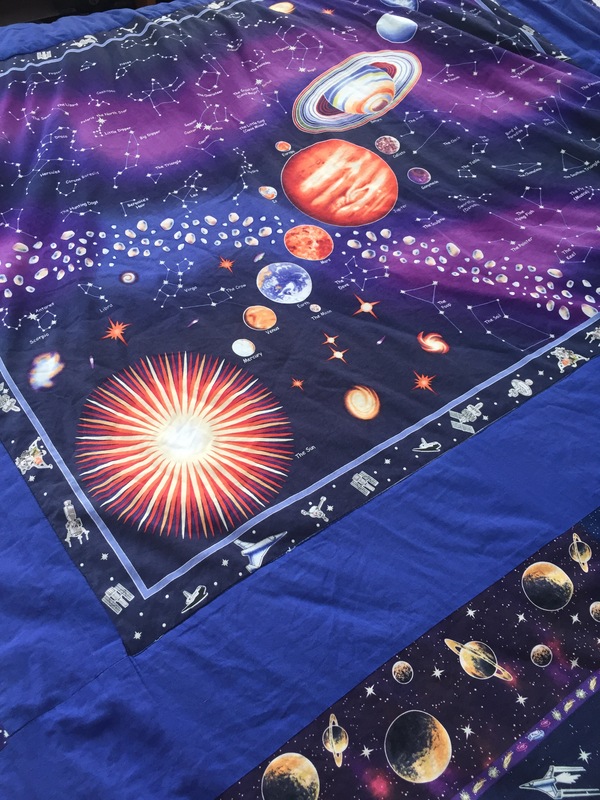 Made using a large central panel featuring the solar system this was a quick make over a weekend and a perfect birthday present for a young man who still uses it 6 years on. And that is where my quilt making endeavours end until my recent make, well apart from another unfinished project – my only other attempt at paper piecing aside from my first ever quilt. I am embarrassed to admit I started this for Middle Postcard when he was still small enough to like sea creatures (well he still does to be honest) and most specifically the Octonauts programme on CBeebies. Then I had another burst of activity when Littlest came along and when he had an interest in pirates and sea creatures. Then I ran out of steam…. Perhaps I will have a grandson one day who might like it?! Now to the present day and the latest quilt. It was for a very special couple who like the colour green and the great outdoors. With those criteria in mind I ordered some fabric. 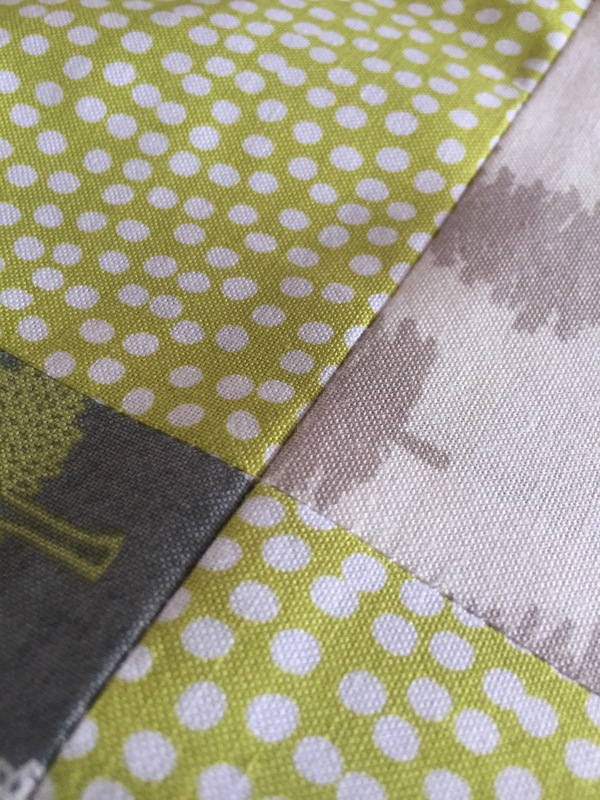 It’s so difficult to order fabric online I find, especially if you want different fabrics to sit closely together – you could end up with something which looks good on the computer screen but in reality clashes hideously. I took a gamble and it paid off, the different fabrics looked just dandy next to each other. (It arrived the same day as a Little Box of Crochet- hence the photo). So the fabric had arrived, but what to do with it? I had all sorts of grand plans for patterns, log cabins etc but thankfully common sense prevailed before I got scissor happy. I opted for the most straight forward design I could think of – squares. 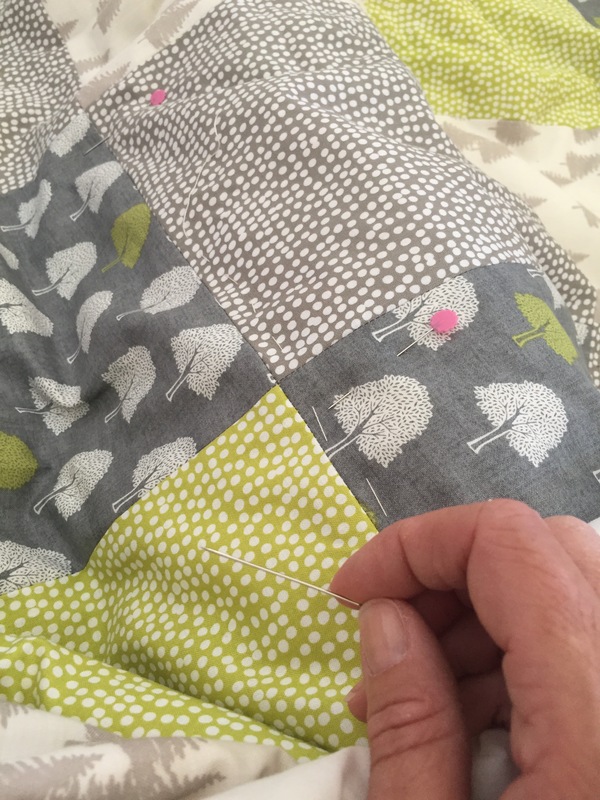 Don’t be fooled by squares though – I have discovered to my cost over the years that squares can be tricky little blighters especially if their corners don’t behave and join up with their neighbours in the right way. I spent a very happy day planning and cutting. I had an unusually free day with absolutely nothing to do whist the Little Postcards were at school (well apart from the usual housework but that can wait). I had such fun listening to podcasts while I worked, it felt like bliss! 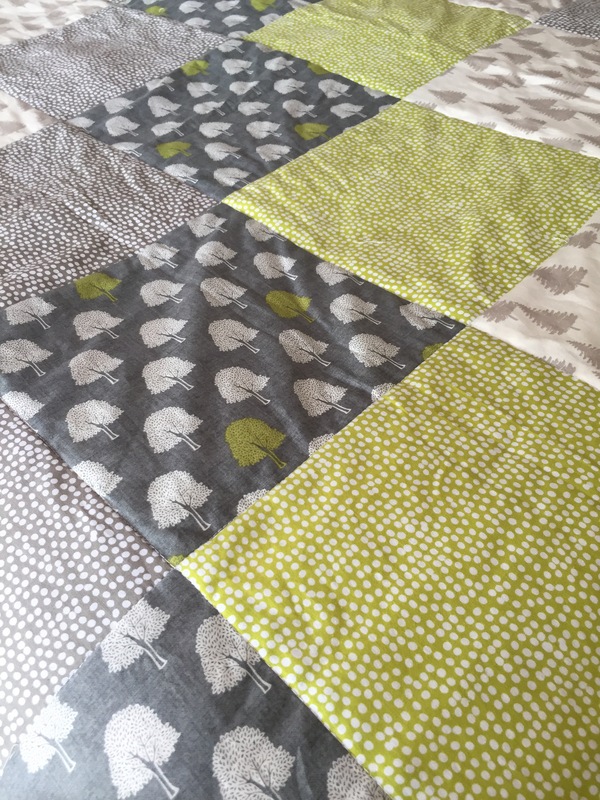 I even managed to get some sewing done as I made up the horizontal rows of the quilt. I worked right down to the bell and had to clear everything up as quick as a flash and run to school in time for pick up time. A week or so later I had the chance to get my machine out again and get the rows finished and then join them. I am so pleased with how they went together, clearly my almost two years of dressmaking classes with a very exacting teacher who has taught me the merits of careful measuring and 1cm seam allowances have paid off! Just look at the corners on THAT! The quilt top then had to be put away for a while as things got too busy. In the meantime I bought a good quality king size white sheet for the backing of the quilt and ordered some nice cotton batting to go in the middle of the quilt sandwich. And finally the time came for me to make that sandwich. 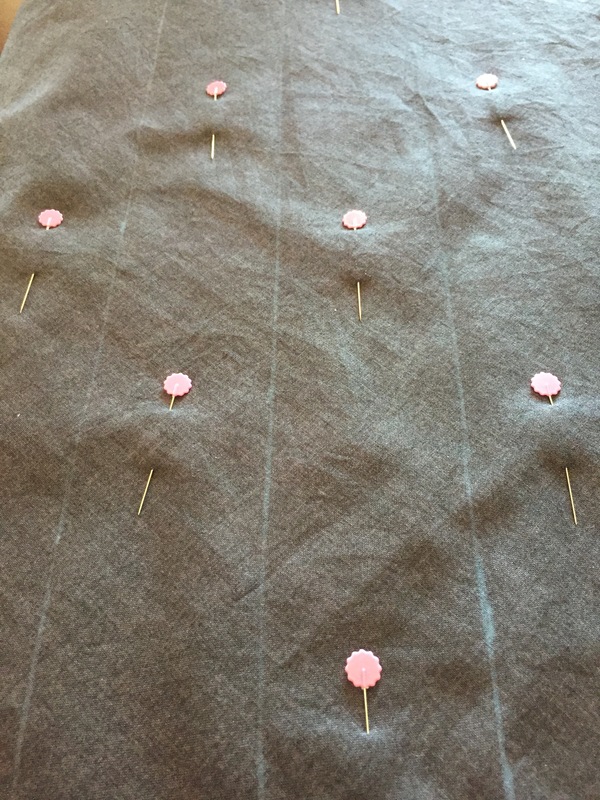 I had kind of been dreading it, thinking that this could be the point when I finally make a mess of the good work I had done patching the top together. 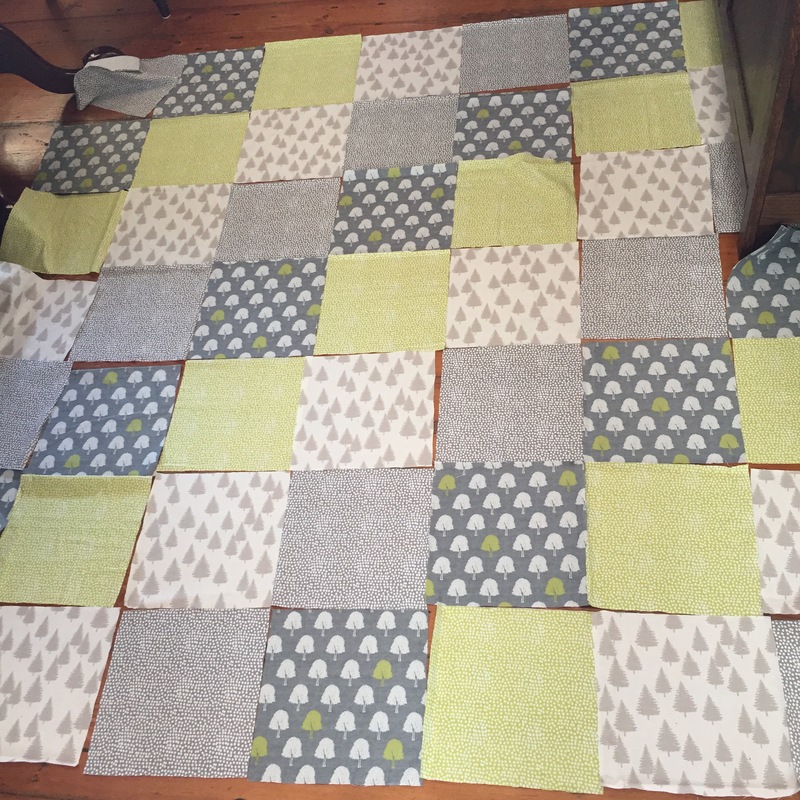 I was so so careful laying the three different layers out onto the lounge floor, trying my utmost to make sure there were no lumps, bumps or bulges anywhere. 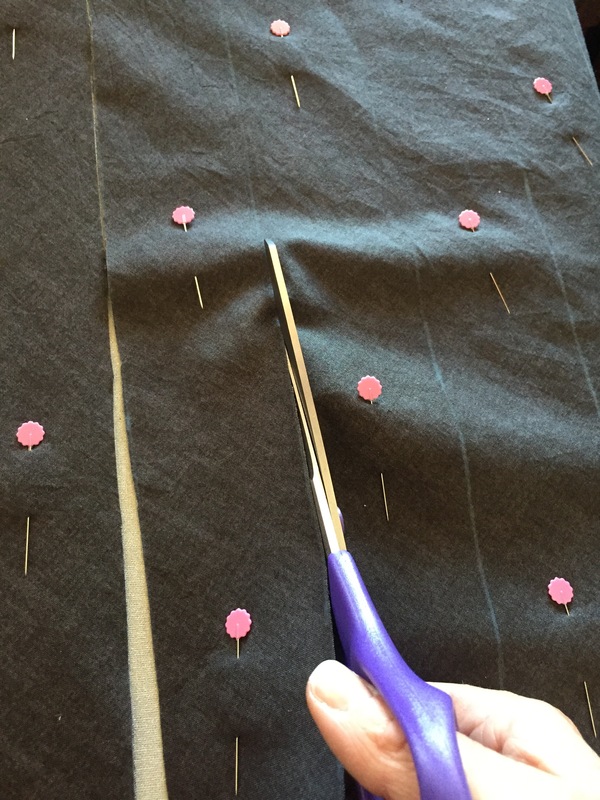 I carefully pinned all the layers together before tacking them all together both horizontally and vertically along all the seams. Perhaps this was a bit belt and braces and over the top but I didn’t want to come a cropper when it was time to machine quilt it and it all go wonky. I machine quilted in the joins between the squares and held my breath for much of it. I have learned from experience that what looks good on the top of the quilt may look dreadful underneath. It worked though! Next up, binding. 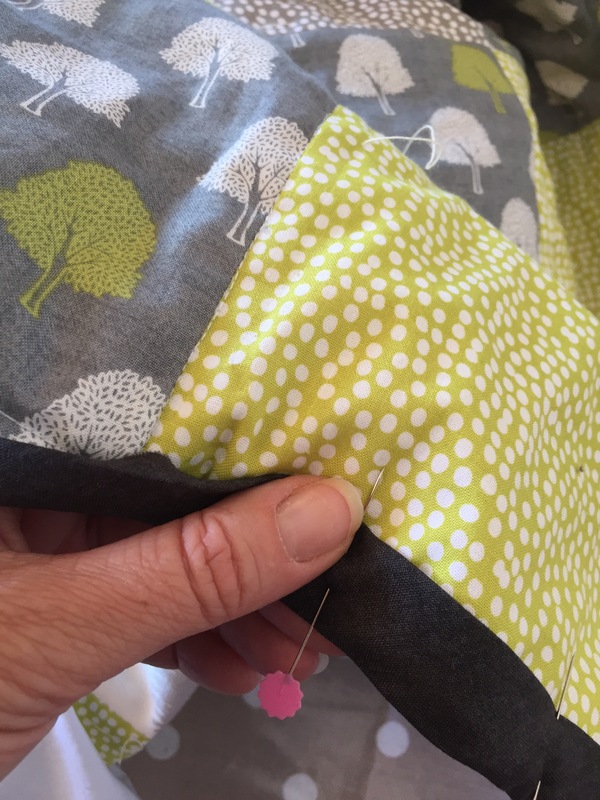 I bought a fifth fabric at the same time as I chose the fabric for the top of the quilt. 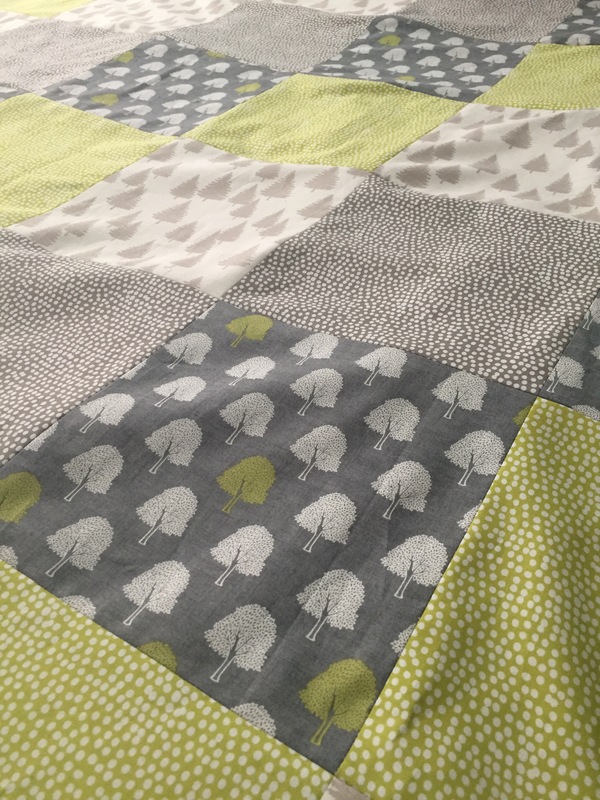 I had intended to use it in the pattern, but the dark grey looked too much of a contrast with the pale grey and acid green of the other patterns so I held on to it and decided to use it to bind the quilt together. 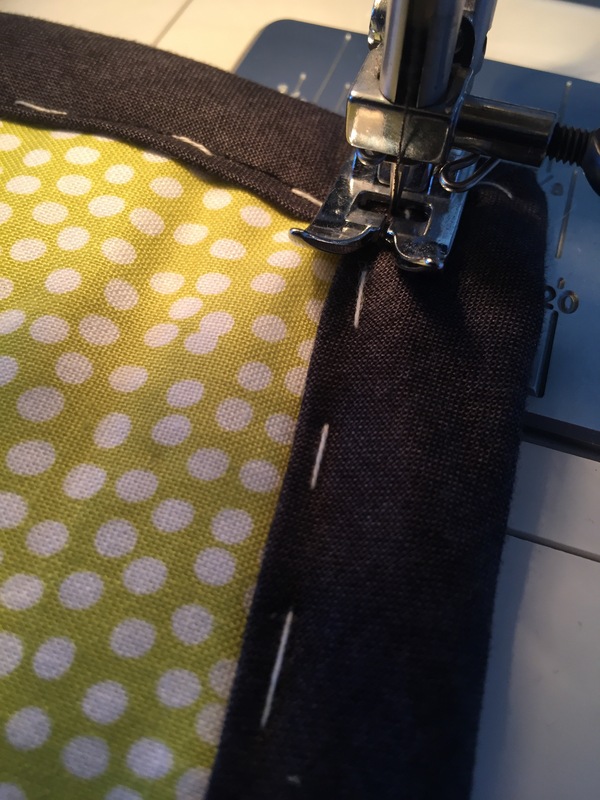 I have never made my own bias binding before but as a habitual reader of craft books over the years I had a pretty good idea of how to go about it. With a protractor to get my angles right I set about marking out the strips ready to be cut. The whole process was really easy, the only problem I had with the whole thing came when I discovered that my iron shoots out steam horizontally and as I was holding the folds into place before steaming them my fingers got a bit sore! The binding went on fine as well, although at times I found it a bit tricky to try and pick up all the fabric on the back of the quilt as well so a little hand stitching had to be done to make sure everything was neat and tidy. And so it was done. Would you like to see it in all it’s glory? I am really pleased with how it all turned out. What’s most important is that the recipients of the quilt liked it too. (And when I took it to my dressmaking teacher to show her – she said it was worth a gold star, so that was a real seal of approval 😊). For interest I bought all of the quilting fabric for this project and the batting from Quilt Room. The staff were really helpful especially when I was slightly dim and did something daft at the online checkout – thank you ladies! 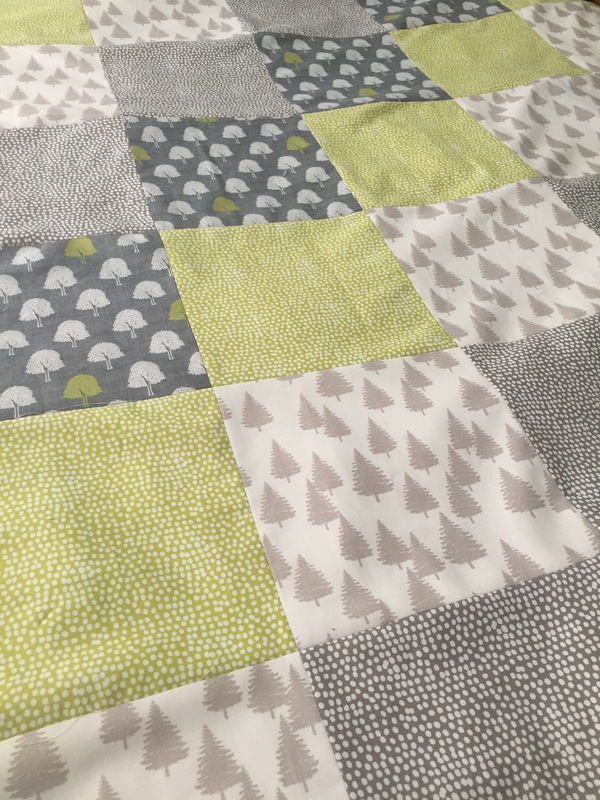 It really does look like your two years of sewing classes have paid off – the corners are perfect and the whole quilt looks beautiful! 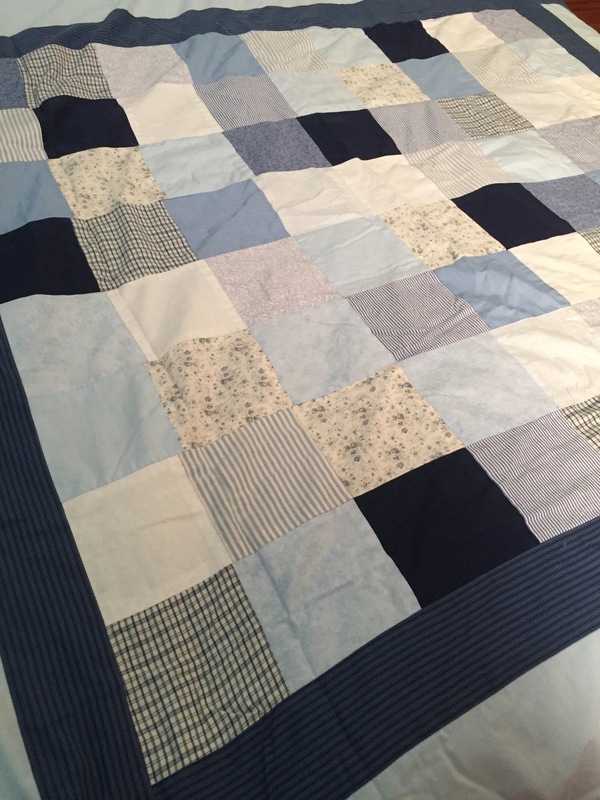 I’ve made a few quilts over the years and they have all turned out less than perfect – I decided to give up on them but remain in awe of those who have persevered and overcome. Lucky recipients and good on you! 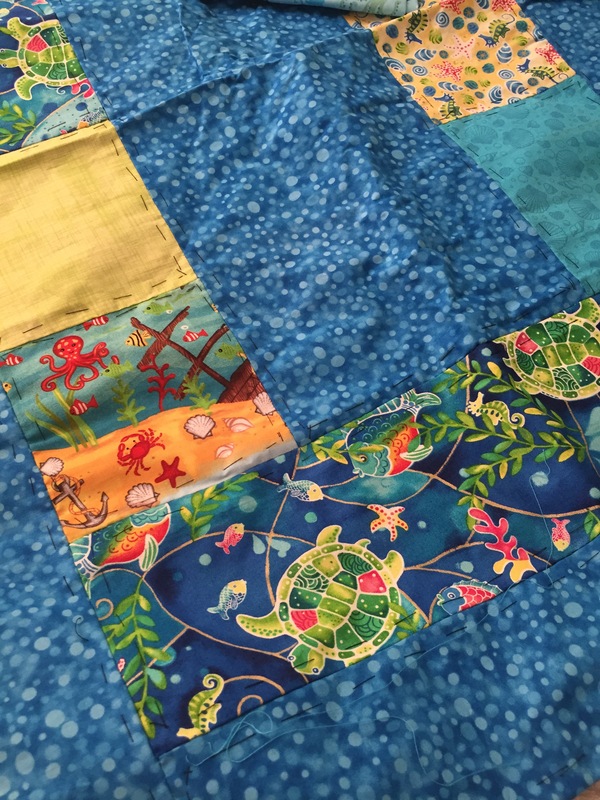 Very creative and wonderful to see beautiful quilts coming to fruition. 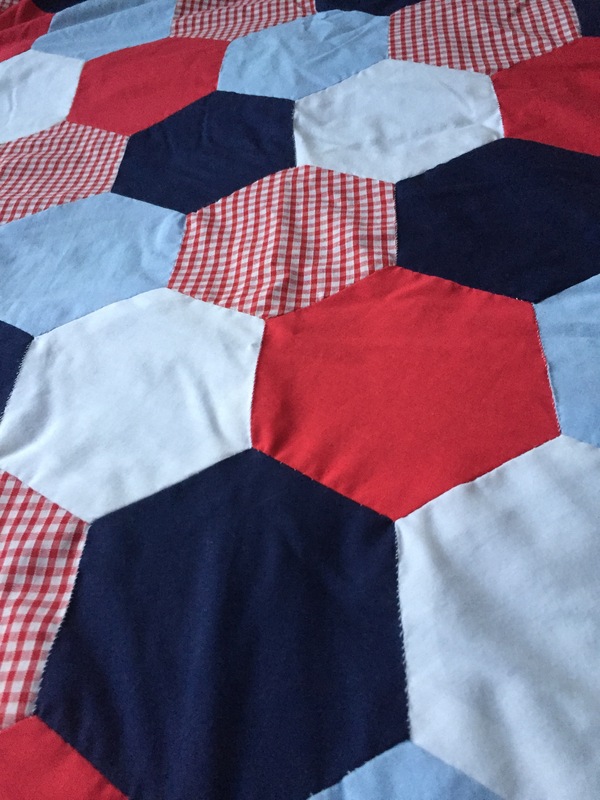 The first image reminds me of the hexagonal patchwork quilt made from Liberty materials my wife and I began as a shared project when first married 43 years ago. Sadly it is not finished . Yet. Two Gold Stars, it’s stunning. Lovely quilts. 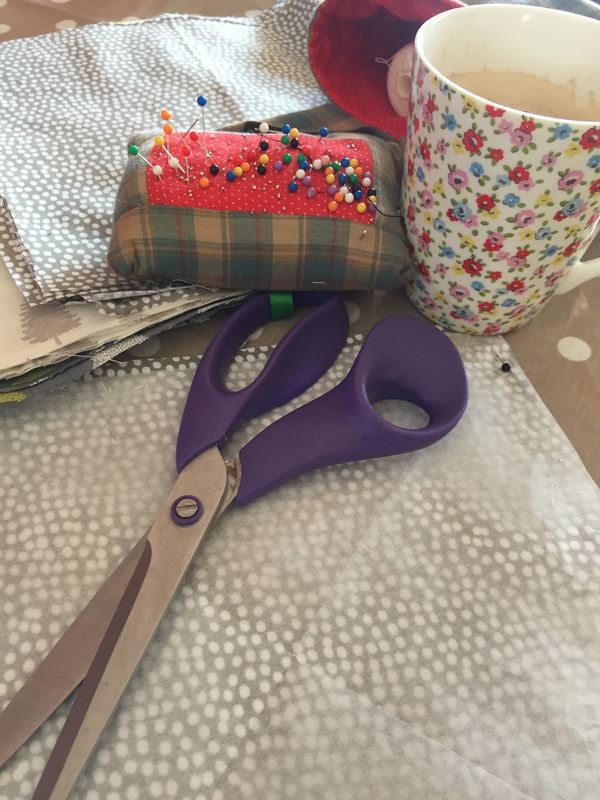 Have enjoyed reading your blog and seeing how your quilt came together. Thank you for a lovely trip through the gorgeous quilts you’ve made. You’re right about buying fabric on line, but your colours work so well. 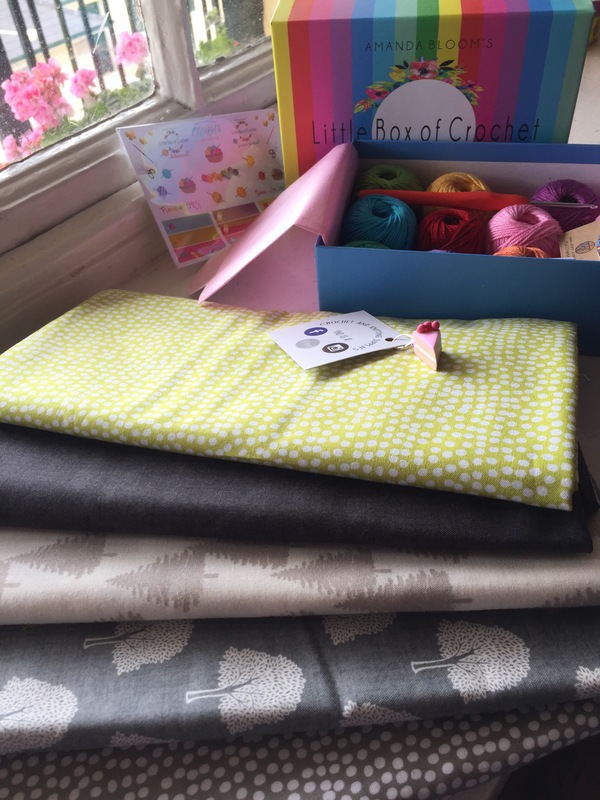 We’re lucky to have two brilliant quilting fabric shops really close. It’s all in the detail – and your perfectionism has paid off big time as this is wonderful! What an heirloom, a wedding present to treasure for generations, no doubt.